Onions are a delicious, nutritious food that can be consumed in various ways. Even people on low-carbohydrate diets eat this vegetable as it is fairly low in carbs. However, the serving size of onions should be limited for people on low-carbohydrate diets, depending on the type of onion being consumed. There are many types of onions, and the exact carb count for each one is different. However, most onions typically have 7 or 8 grams of carbohydrates in every 100-gram serving. Onions are typically considered to be fairly low in carbohydrates. They provide between 2 and 6 percent of your daily value for carbohydrates in every 100 grams (3.5 ounces) if you're following a standard 2,000-calorie diet. Although this is less than the amount in many other vegetables, such as beets and butternut squash, onions may not be considered a low-carb vegetable for someone on a low-carbohydrate diet. There are a variety of different types of onions such as red onions, yellow onions, spring onions, sweet onions and shallots. All of these onions contain different amounts of vitamins and minerals, but they generally have between 7 and 8 grams of carbohydrates in every 100 grams. The amount of fiber onions have varies substantially: For example, a 100-gram serving of sweet onions has less than 1 gram of fiber; in contrast, the same serving of shallots has 3.2 grams of fiber. In general, onions are considered to be low in fiber and are not very filling. However, they are highly nutritious, which means that you should consume them, even if you have to do so in moderation when you're following a low-carb diet. If you're on a low-carbohydrate diet, you obviously want to limit your daily carbohydrate intake. However, it's not so simple. While you need to choose foods that are low in carbohydrates, you should simultaneously select foods that are high in fiber. Onions typically aren't considered to be high in fiber, unlike many other low-carb vegetables. According to the Food and Drug Administration, fiber is an essential part of your diet and benefits your digestive system. Most people who eat the average 2,000-calorie diet should be consuming at least 25 grams of fiber each day. Low-carbohydrate diets like Atkins and the ketogenic diet also recognize this, which is why the carbohydrate limitation for these diets is based on net carbs. Net carbs can be calculated by taking your total carbohydrate count and subtracting the amount of fiber. You also subtract sugar alcohols when calculating net carbs. Since onions are all different, you'd have to calculate the net carbs for each type of onion to see if it's suitable for your low-carb diet. Low-carb diets can require you to consume as little as 20 net carbs a day or as much as 100 net carbs a day. There aren't any low-carb vegetables with zero net carbs, but many plant-based foods have less than 1 gram of net carbs per serving and even as little as 0.1 gram. Typically, low-carb vegetables have less than 6 net carbs per serving (1/2 cup). Spring onions could be considered suitable for a low-carb diet, as they have 7.3 grams of carbohydrates, 2.6 grams of which come from fiber. This means that they supply 4.7 grams of net carbs in every 100-gram serving. In contrast, shallots are not really considered to be low-carb vegetables. With 16.8 grams of carbohydrates in every 100 grams and only 3.2 grams coming from fiber, the net carbs for 100 grams of shallots total 13.6 grams. The potent flavor of onions makes them a good choice for people on low-carbohydrate diets regardless of carbohydrate content. Onions have a very strong taste, which means that as little as 1 tablespoon (between 6 and 10 grams, depending on the type of onion) can add a substantial amount of flavor to every meal. While you wouldn't consume 100 grams of shallots on a low-carbohydrate diet, 2 tablespoons (20 grams) provides you with 3.4 net carbs and a lot of flavor. Another alternative is to use onion powder sparingly, that way you can consume other higher-fiber, lower-carbohydrate foods. 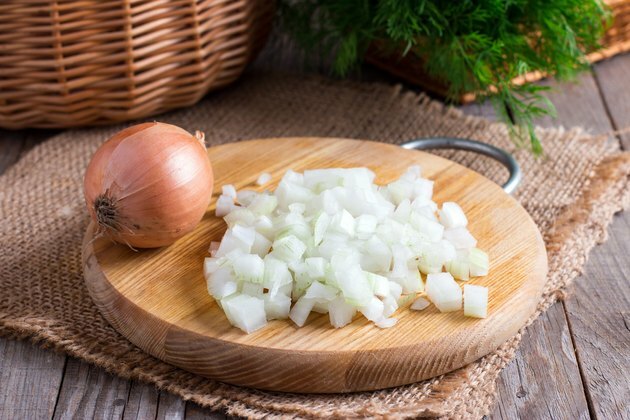 If you're on a low carbohydrate diet and enjoy eating onions, you can easily use them in salads, stir-fries and soups. They're also commonly used to flavor meat, and you can even use them to create keto-friendly onion rings. Onions are known for their antioxidants as well. Red onions have more antioxidants compared to other onions, for example, white onions and yellow onions. They're also thought to have a range of beneficial properties that go beyond their nutritional value such as anti-cancer, antibacterial, antifungal and antiparasitic properties. And they're considered to positively affect the health of your cardiovascular system, lungs, bones and eyes. Critical Reviews in Food Science and Nutrition: Onion: Nature Protection Against Physiological Threats. Can Onions Make You Lose Weight? What is the Nutritional Value of Onions?